The “In God We Trust” momentum continues throughout Hampton Roads, Virginia. 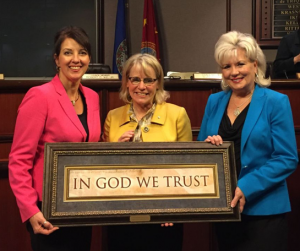 On Tuesday evening the Chesapeake City Council passed a resolution offered by Council member Suzy Kelly to have “In God We Trust” displayed in the Chesapeake City Council Chambers. Chesapeake joined hundreds of city councils nationwide who have joined the movement. Yesterday CBN News interviewed Congressman Forbes to discuss the In God We Trust. Put It Up! initiative that is sweeping the nation.